All Madison College Policies apply including: Madison College Libraries computer use policies, Madison College Student Computer Systems Guidelines, and the Madison College Student Code of Conduct. All users must comply with copyright laws when creating materials. Refer to our Copyright for Students research guide. No food is allowed in the Group Study & Media Studios; Covered beverages only. Library staff and other Madison College personnel monitor the use of the rooms and computers. The Madison College Libraries reserves the right to refuse a patron the use of its media rooms or resources in accordance with the policies outlined in this document. Students should have no expectation of privacy. Exiting the Library with items on closed reserve is considered theft and will be reported. Students working with audio in the rooms should keep the volume low or use headphones. Abuse of equipment or Group Study Room policies will result in termination of use for applicable checkout period. Repeat offenders of policy will have equipment and studio room checkout privileges suspended for duration of current semester. 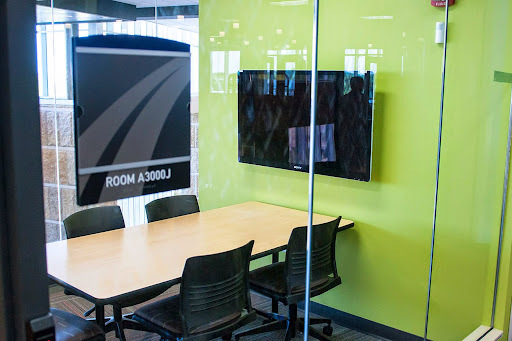 Rooms and equipment are reserved and scheduled through the Madison College Libraries online group study room booking system. Equipment and rooms are available for use during library open hours until 30 minutes before the library closes. All equipment on reserve and room keys must be returned 30 minutes prior to library closing time. Only Madison College students may book and use Madison College Library group study rooms. Staff, faculty and community users may not reserve the library group study rooms. Each student may book up to 2 hours per day in 30 minute timeslots but may not exceed 4 hours per week. Reservations may be made up to 2 weeks in advance. One group cannot reserve a room for consecutive (back-to-back) sessions. Students checking out a room key or equipment must accept full responsibility for those items and for resources located in the room. Keys or equipment may not be transferred to another person or removed from the library. Students will need to read, sign and agree to the usage guidelines. Madison College OneCard Student ID or government issued photo ID is required. Use is limited to currently enrolled Madison College students. Faculty, staff, and community users are not eligible. Reservations are held for 10 minutes. If you don't show up in the first 10 minutes of your reservation, your room may be given to someone else. Please call to cancel if your plans change or click the cancellation link in the booking confirmation email you received in your student email. No shows may affect your ability to reserve rooms in the future. Keep in mind that individuals may use the Quiet Study Room in the Truax Library, tutoring is available in the Student Achievement Centers, and Madison College computer labs and other areas of the building are available for general computer functions. Rooms and equipment are often in high demand. Students should plan accordingly and schedule well in advance. Multimedia projects can be time-consuming; you may need to schedule multiple sessions. Plan wisely, allow extra time, and don’t leave your project until the last minute. Students should schedule an appointment in advance for assistance with getting started on a multimedia project using the library equipment and software. Contact: DMarconnet@madisoncollege.edu or JKasch@madisoncollege.edu. Drop-in assistance is generally not available. Library staff are unable to offer in-depth instruction on applications or create a project for you, but can offer general advice and help you get started. Remember to bring your prepared script, project plan, storyboard, and any supporting materials such as images, cameras, video, and storage media. Additional help resources. Madison College and the Madison College Libraries are not responsible for any lost or damaged files. Files may be saved temporarily to the hard drive of a computer while you are working on them, but should be backed up and saved often to other storage media such as a USB drive, external hard drive, or DVD. Remember that media files can be very large and that saving the files or burning a DVD can take a long time and a lot of storage space. All students are responsible for backing up and saving their own work to their own media. Multimedia equipment is for use by students in the library only. Most equipment is available as closed-reserves from the library circulation and reserves desk. See our multimedia equipment page for more information. laptops. All the computers in the lab are in use? That happens, we're a busy lab, but we have additional laptops that students can use in our libraries. memory card readers: Need images from your camera for your assignment? Use a memory card reader. floppy disk reader: Your old resume is on a floppy disk? It's time to update your storage location, but we have a floppy card reader. assorted cables (hdmi, usb, etc): Need a cable, connector, or adapter? We might have one. We can't have every cable or device, but we have an assortment. All group study rooms have a large wall-mounted monitor or iMac. See our multimedia equipment page for more information. Any recording involving audio will require a room reservation as well so that other library patrons are not disturbed and so you don't record a lot of background noise. Keep in mind that multimedia projects take a lot of time, so please plan accordingly. Multimedia rooms are frequently in use, so you should book a room ahead of time. Be sure to bring your prepared script, your student ID card (OneCard), and any other equipment you may need such as a camera, power adapters, and cables. We have some USB and firewire cables for student use in the library, but we can't assure that we have every cable a student might need to work with their personal camera or laptop. There are 4 rooms available in the Truax Library which can be reserved by students. The rooms accommodate 4-6 persons maximum. You can check availability, get more information and reserve a study room online from our libraries' web page. Ask for assistance at the Truax Library Help Desk. Students may book a room up to 2 weeks in advance. Each student may book up to 2 hours per day in 30 minute timeslots but may not exceed 4 hours per week. If you need to reserve any equipment for multimedia use, call the Truax Library at (608)246-6640. To book more than 30 minutes at a time, you will have to click multiple time slot.